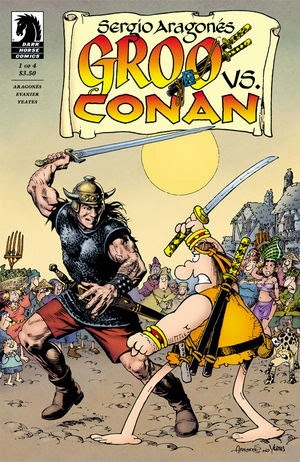 I have never read any of Sergio Argones’ Groo the Wanderer, and I have only ever read a little bit of the Conan comics. But when I saw this issue at my local comic shop I knew I was going to buy it. It was just crazy enough of a concept to be a great comic. This book was exactly what I expected it to be. When it highlighted Conan it was gritty and had lots of over the top action and innuendo. When Groo was the focus it became comical and the dialogue was way more simplistic (in a good way). What I wasn’t expecting was the story that focused on Sergio Argones and his agent that mirrored the story taking place between Conan and Groo. Sergio had no problem cracking jokes about himself and the concept of battles between fictional characters in this book. That is part of what made this really jump off the page at me. The art was handled brilliantly. When it was focused on Conan the art was done by Thomas Yeates, which was clean and really looked like the art for most of the Dark Horse Conan books. When it was Groo’s story and the story that focused on Sergio Argones himself Argones does his usual cartoony art style. But it is really great when the characters from Groo’s world go looking for Conan, so the characters look like an Argones character in the Conan art style background. This was a really fun read and I may actually pick up the rest of the series in issues as they come out. It all depends on how much I already have coming out those weeks.